Grown outdoors on pristine, subtropical Japanese coral islands, in rich, spring-fed freshwater ponds, Vega Chlorella’s cell walls are high-pressure jet sprayed to achieve optimum digestibility. Vega Chlorella is a unique strain, the result of 35 years of research, developed to deliver Chlorella Growth Factor. Vega Chlorella is processed in state-of-the-art facilities under the strictest of quality standards. Vega Chlorella’s cell walls are high-pressure jet sprayed to increase digestibility. Unique to chlorella, CGF is a water-soluble extract comprised of substances including proteins, amino acids, peptides, nucleic acids, sugars and vitamins. Enabling chlorella to multiply four times every 20 hours —making chlorella one of the fastest-growing organisms on the planet— CGF is produced by chlorella during intense photosynthesis. CGF is believed to be the core of some of chlorella’s health benefits. An antioxidant powerhouse, chlorella is a concentrated source of chlorophyll, shown to have antioxidant properties.25 Free radical scavenging and quenching carotenoids, specifically the provitamin beta-Carotene, and lutein—prized for its role in supporting eye health—are also abundant in chlorella. Vega Chlorella is dairy, gluten and soy free. 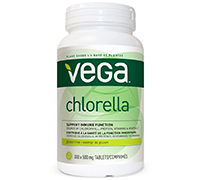 Vega Chlorella is available in 150 g powder, 150 and 300 count tablets. One serving / recommended dose of Vega Chlorella is 2 to 3 tablets, 2 times per day / 1 tsp powder daily (2,500 mg), or as directed by a health care practitioner. Cautions and warnings: Consult a doctor prior to use if you are taking blood thinning medication. Avoid prolonged exposure to sunlight and UV. Some people may experience temporary, cleansing-type symptoms when first taking this product; discontinue use if you experience persisting abdominal cramps, diarrhea, flatus or nausea. Keep out of reach of children. There is enough iron in a 150 g powder or 300 count tablet package to seriously harm a child.